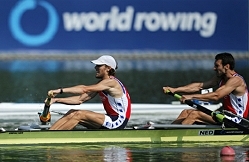 EBU and FISA renew agreement on media rights for rowing events. Geneva, October 2016: The EBU and the World Rowing Federation (FISA) have agreed on a four-year renewal of all European media rights from 2017-2020 for rowing’s premier world and European events. This agreement includes the World Rowing Championships in 2017, 2018 and 2019, the annual World Rowing Cup series and the European Rowing Championships. The 2019 World Rowing Championships will serve as qualification event for the Tokyo 2020 Olympic and Paralympic Games. The opening event of the renewed agreement will be the first regatta of the 2017 World Rowing Cup series from 5th to 7th May in Belgrade, Serbia.